Congress passed three more NAFTA-like trade agreements for President Obama and his advisers, the CEOs. They are Panama, Columbia and South Korea (KORUS-FTA). Once more American workers will lose jobs and our deficits will climb higher. But for the CEOs of multinational (not American anymore) corporations, it’s all about how much wealth they can amass. Nothing else matters. Someone else will take care of any problems they cause. If the trade agreements are so great for producing new jobs, why did the House also pass a “measure to expand a benefits program for workers who lose jobs to foreign competition by a vote of 307 to 122?” (NYTIMES) I know. To get the Democrats to vote for the agreements. But as before, these benefits will be used. So nothing has changed as America continues the slide into a failed nation, overcrowded, including massive illegal immigration, with record-breaking unemployment and no safety net. Guess what finally happens. You have lots of choices, none good. Estimates are that the trade agreements with Columbia and South Korea will cost America 214,000 good-paying jobs. “The US Business and Industry Council, an association of small and mid-size firms…strongly oppose the deal.” ‘We can’t imagine that KORUS would serve current US economic interests. '” Alan Tonelson. While running for president, Obama supported the Peru trade agreement because it had been “changed” and now had labor and environmental protections. That was false and Obama knew it. There were no enforceable protections. “I strongly support the inclusion of meaningful, enforceable labor and environmental standards in all trade agreements. As president, I will work to ensure that the U.S. again leads the world in ensuring that consumer products produced across the world are done in a manner that supports workers, not undermines them.” Read more. Once again, Obama lied. There are no enforceable, key word “enforceable”, standards for labor or the environment in any of the four free trade agreements, including the Peru-FTA. “Trade agreements… signed by Bill Clinton (NAFTA) insure that labor and the environment side accord language will not hurt the transnational corporations’ quest for profits since there are no enforcement mechanisms in these areas. That includes the Peru-FTA as well as pending trade agreements with Columbia, Panama and South Korea. The Peru agreement, negotiated behind closed doors between the Democrats (Charlie Rangel and Max Baucus) and the Bush administration, contains no enforcement mechanisms. Otherwise, big business and the U.S. Chamber of Commerce wouldn’t support it. That “agreement, like NAFTA and CAFTA, makes no provisions to protect workers or the environment. Rangel and the Democrats, in making a deal with Bush, discarded their base like Bill Clinton did with NAFTA.” Read more. 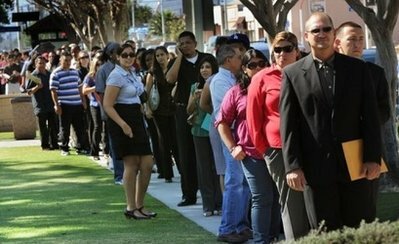 This latest attack on American workers will destroy any future for those unemployed. Obama pushed through these latest free trade agreements in the usual way, with lies, the generosity of corporate donors and, of course, just plain stupid members of Congress. And we still have the massive, unrelenting invasion of Mexicans, the new “Americans”, who will take every job in America they can and lower wages for Jeffrey Immelt of General Electric and his corporate partners in crime. They won’t have to ship as many jobs overseas now since Mexican workers can build anything you want for $3.50 or so per hour. As I’ve said before, Americans need to coalesce by the tens of millions and take action. For example, recall every member of Congress who voted for these trade agreements and push for a limit of two terms in office. Then tell President Obama where you stand. 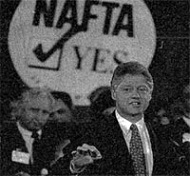 No more NAFTA type trade agreements and demand revisiting those already in effect. And get out of the WTO. Without a massive show of force and determination, your efforts will be fruitless. Then, when this corporate-run global economy collapses, the workers are the ones who will suffer even more. The CEOs already have their safe havens. 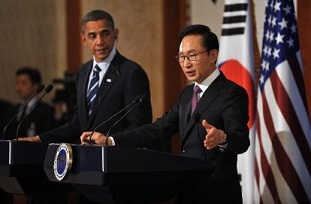 Obama will sign all three trade agreements today (Oct. 21, 2011)- Columbia, Korea and Panama.